A flavor combination that's hard to beat! 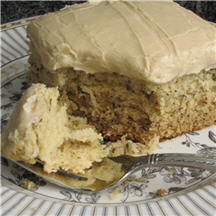 Moist banana cake and creamy caramel-flavored penuche frosting complement each other perfectly. This homemade banana cake is prepared using the one-bowl method. Making a cake "from scratch" couldn't be easier and it works every time! Preheat oven to 350°F (175°C)**. Grease and flour a 13x9x2-inch baking pan; set aside. For the Banana Cake: Place all ingredients in a large mixing bowl and beat on low speed just until ingredients are wet, increase speed to medium-high and continue beating for 2 minutes. Pour batter into prepared baking pan, spreading evenly. Bake for 35 to 45 minutes or until a wooden pick inserted near the center comes out clean. Cool completely on a wire rack before frosting. For Penuche Frosting: Place the brown sugar, butter and milk in a small saucepan and bring to a boil over medium heat; boil for 2 minutes, stirring constantly. Remove from heat; set aside to allow mixture to cool to room temperature. Once mixture has cooled, stir in the vanilla and then add the powdered sugar, stirring just until ingredients are combined, then beat with an electric mixer on high (or vigorously with a wooden spoon) until frosting is creamy and of a spreadable consistency. If frosting is too thick, add a teaspoon or more of milk until desired consistency is reached; frost immediately. *To make 2/3 cup sour milk, place 2 teaspoons white vinegar into measuring cup and fill with milk to measure 2/3 cup, allow to set for about 5 minutes before using. **If using a dark baking pan or glass baking dish, reduce oven temperature to 325°F (160°C). Tip: If desired, garnish top of cake with finely chopped toasted nuts. Nutritional Information Per Serving (1/12 of recipe): 446.8 calories; 34% calories from fat; 17.6g total fat; 56.6mg cholesterol; 334.8mg sodium; 207.3mg potassium; 69.0g carbohydrates; 1.2g fiber; 46.8g sugar; 67.8g net carbs; 4.7g protein.